Elka double insulated candle effect ceiling pendant light in satin chrome. This is a 5 light pendant which is attached to the ceiling by a circular satin chrome ceiling plate. 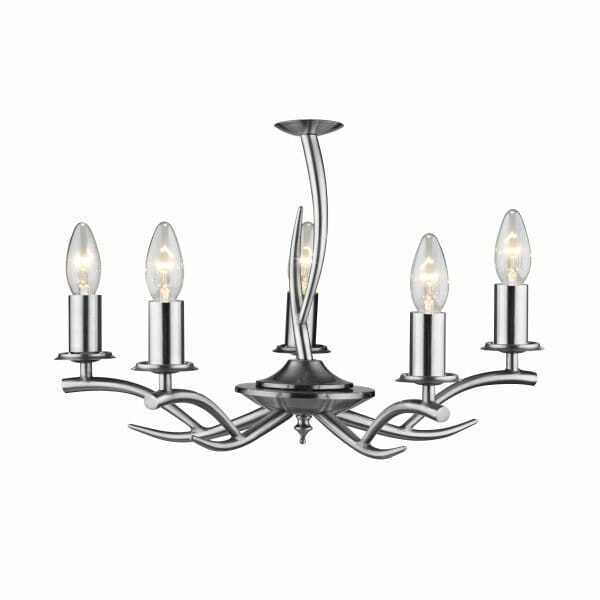 The 5 candle style lights are carried on the curved antler arms. Each light has a satin chrome candle drip and sconce. This light has a dual mount facility - it is supplied with a chain which can be used to lengthen the drop, or fitted semi flush as shown in the picture. This makes a versatile light suitable for different ceiling heights. The centre rod of the light fitting is offset echoing the shape of the arms. The stag effect antler design of the light makes it a perfect choice for a modern country house feel.